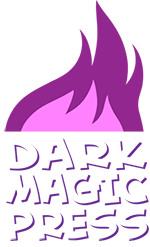 UPDATE: Check out the sequel comic! This comic is the result of my art skills fused with that of our lead writer, Locke. He did the pencils while I did the inking and the coloring. Here’s a close-up of the second panel. Also, why not revisit that old Tryndamere comic for some more League of Legends goodness? We even did a miniseries called Everyone Loves Ezreal! This entry was posted on Monday, October 25th, 2010 at 12:00 am and is filed under Comics. You can follow any responses to this entry through the RSS 2.0 feed. Both comments and pings are currently closed. HAHAHAHAHAHA~! I have NO idea what the second panel is referencing, but holy crap is it awesome! In the game league of legends the two of them are champions, and garen lies hiding in bushes, then jumping out whenever someone comes close spining his giant sword and screaming DEMACIAAAAAAA!!!!!!!!!!!!! To further elaborate, Garen has a skill called Judgment where he spins around and hits enemies for ridiculous damage at melee range as long as he stays in melee range for the duration. If people are outside the brush, they can’t see who is inside. So a common occurrence is for someone to go to the bush, check inside, and then find a Garen right next to them, who proceeds to Judgment and kill them ridiculously quickly. I Love ur work and read ur whole comic during the last two days! I’m hoping for some League-of-Legends-StarWars-LEGO-PirateNinja-Dinosaurstuff!!! – being aware of the possibility to see world and universe getting humiliated by teh pure 1337ness! Greetings from Germany, and may the force b with u! P.S. : This is the best comic u did, ur masterpiece, ur 9th sinfonic – or so! keep this up! Def. made my day, i h8 op garen, think he’s got to be nerfed within the next patches! P.S.S. 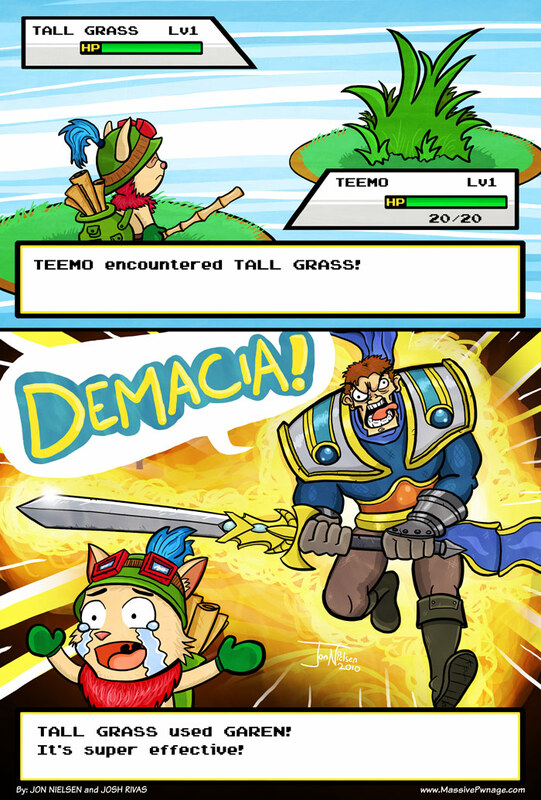 : Poor little teemo! but we’ll c if he kills garen with his new astronaut skin!!!!!! Thanks! And yeah, that skin looks awesome, haha. Teemo is pretty UP right now. In ranked tier lists he’s Tier 4, right next to Jax. The only thing you need to kill a teemo with Garen is Judgment! Seriously? He kicks my %$@ almost every time fight him with Xin or Yi. Thats could be just those champs though. that’s cause Blind shot $#!^ against garen’s spin2win. but it does stop Yi and Jax from getting in 3-4 hits. That’d be because Yi and Xin are close combat heroes, Teemo’s blind makes him way too deadly to be engaged 1v1. Bwahahahaha, I laughed the second I saw this!! Wow, this was drawn very well, nice job guys! although tbh I wouldn’t fear Garen much as Teemo, he can easily stay just outside his range. As a Teemo Summoner I chalange you to prove that Garen can kick is but that easly (well, noob summuners will be noobs). Dear magical being that governs everything graphically inclined, you have put forth gold. No lies though, nearly coughed up a lung laughing at it. DEMACIA! Amazing! I wish I could just search for LoL stuff! That reminds me, I need to figure out how to get a search function programed into the site. Shouldn’t be too hard. I hope. *sigh* if only I had stuck with Digital Arts…I would have been able to help you out. I’m having chest pains trying not to laugh too loud. I’ve got a friend hung up on Teemo, he doesn’t like to play with anything else at all. I’m definately linking him this. I’m very glad that towers don’t level. My friend feeds them regularly. anybody thats played “any” other *rts* game with towers involved knows LOL has the hatin and unforgiving towers ever. I DONT LET TOWERS GET IN THE WAY WHEN SUMBODY RUNS AWAY WITH A SMIDGE OF HP….. sides, its woth it when i see poison drop ’em before the tower smites me into the ground. If u shout “DEMACIAAAA!” somewhere, everyone will run away from you without turning back. Useful for escaping from a bad situation, I Garen-tee!….. Got it? I see, you read the garen ms paint hate thread. First, I’m always happy when I see Garen on the other team, because I know I can outrun him, and he’s fun to throw. This comic made me buy Soul Silver. lol this is just like pokemon XD, its awesome. This is so awesome on so many levels. Hahahaha, omg. I’ve been playing LoL for awhile and this has got to eb the funniest LoL-related thing I’ve ever seen. I just picked up Garen after he was free last week. He’s such an %$@hole, it’s great! P.S. Teemo was really cute. I love this comic! Its epicness is extremely epic! I have to say, however, that I normally play Twitch, so Teemo is op to me because of his poison levels. But, late game, he can’t touch me, INVISITWITCH FTW! Heh, not to mention IE+spray And Pray=DEATH! Ok, im going to go change my pants now. I don’t normally comment on comics; but this was so good I thought I needed to. Actually when I first saw it, I thought it was a combo of Final Fantasy 1 and LoL. 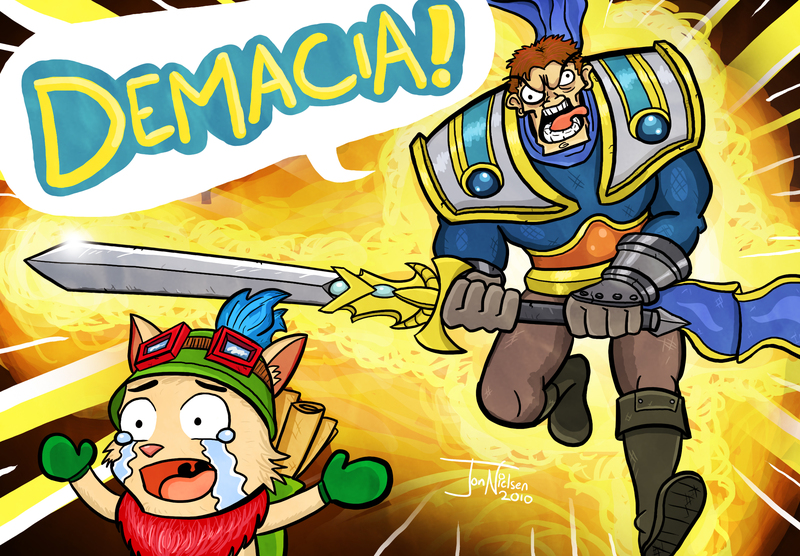 I just love the way Teemo looks in this and Garen’s “battle cry” face is really funny. Yeah, a silly battle-face was my intention from the start. 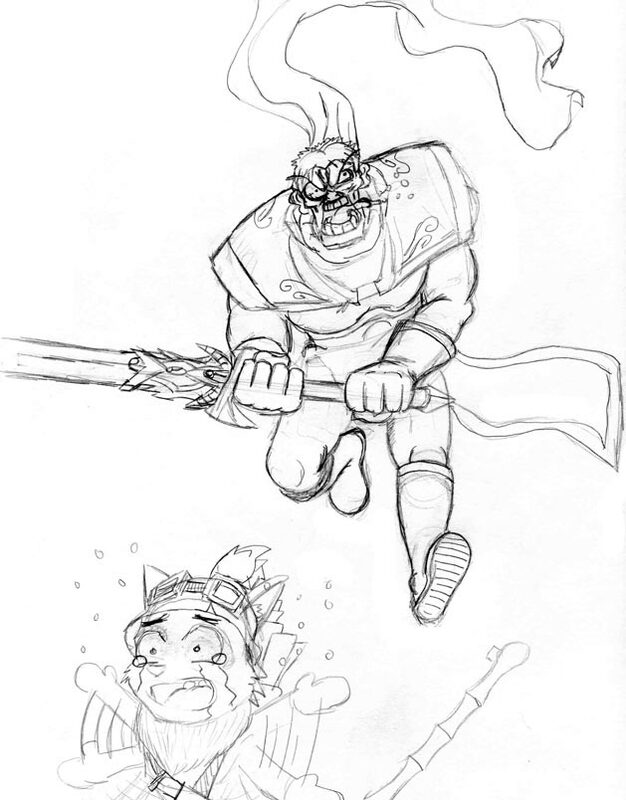 I wanted Garen to look as ridiculous as possible while charging, like a crazy psychopath with a broadsword. Well thats pretty much exactly what he is. I still love Garen tho. I’d say that he is a sociopath.That comment is very offensive to real life psychopaths. Hah, I’m an avid Garen player and I approve of this statement. Whenever Teemo’s on the opposite team I always catch him in the bushes and I even kill them. Haters gonna hate. Garen’s gonna…… judgement…. or…. sunfire. No middle ground. Im gonna process you guys. You guys almost kill me of heart attack. Its so true. And teemo could have an more panic face XD.